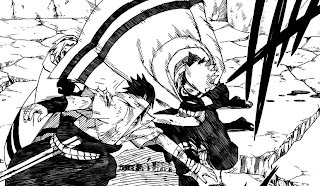 Naruto Manga Chapter 483 Master and Student Meet Again! is already out. Kakashi chases Sakura and Sasuke, he found kiba and others have been falled by sleeping gas. After ask to kiba which way Sakura go, Kakashi left them. While Sakura try to get thrust from sasuke. Sasuke tell Sakura his goal and to prove that sakura would do anything for him, Sasuke asked her to killing Karin. But so suprised, when Sakura is still thinking to stab Sasuke, he is the first one making move to attack Sakura from behind. Fortunately, Kakashi come on the right time and save sakura. A little memories flashback between master and student, before they start fight each other, Kakashi want to make sure Sasuke stop his revenge. But too late, Sasuke already is in the darkness. Kakashi ask Sakura to take Karin into saved place and heal her to get information about their enemy. And Naruto still on the way to go there.